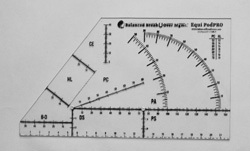 The Goniometer: Caudal - Cranial Balance: Identifies uneven load over the foot thru the coffin joint. 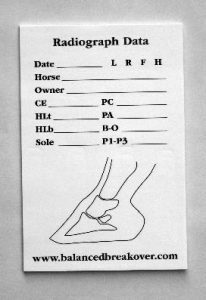 Accurately tells how much to adjust the foot to the degree. Establishes a basis for therapy. 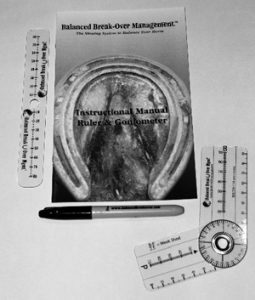 The Ruler: Palmer Distal Balance: Evaluates function of the hoof capsule as it relates to the coffin bone. Identifies center of rotation as it relates to the bottom of the foot. Gives a numerical position for the break-over radius and heel placement of the shoe as it relates to center of rotation. T-Square: Medial - Lateral Balance: Promotes even loading. Accurate alignment of the foot to the leg. Lets you see the whole hoof. 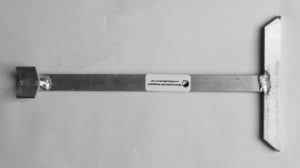 Protractor- Equi Pod Pro: Reads a lateral radiograph of the equine foot. 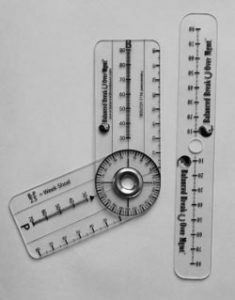 Various scales and two sets of protractors allow for fast and easy assessment of soft tissue areas and bone angles.